Competitors aim to shoot the small “kill” zone that forms part of a larger metal faceplate. These face plates are often shaped to resemble small game animals, although there is currently a move towards simple geometric shapes. On most competition targets, the hit zone forms the end of a short lever that tips the faceplate backwards when successfully hit. These targets have to be reset by tugging on a length of cord attached to the faceplate above the hinge. Targets are shot from open “gates” in a firing line, and are divided into “lanes” of two targets each. Many competitions impose a time restriction of 2 minutes to shoot both targets after a competitor first looks through his or her sights. Targets may be placed at any distance between 10 yards (9.144 m) and 55 yards (50.292 m) from the firing line. Targets are often placed at about the same height as the shooter, but it is not uncommon for them to appear high up banks or in trees, or down steep slopes. The hit or “kill” zone of a target is always circular, and nominally 40–45 mm in diameter, although “reducer” targets as small as 25 mm diameter may be employed for seated shots up to 35 yards (32.004 m). The targets are painted with the kill a contrasting color to aid visibility, although the paint is quickly removed by hits during competitions, making it harder to distinguish. 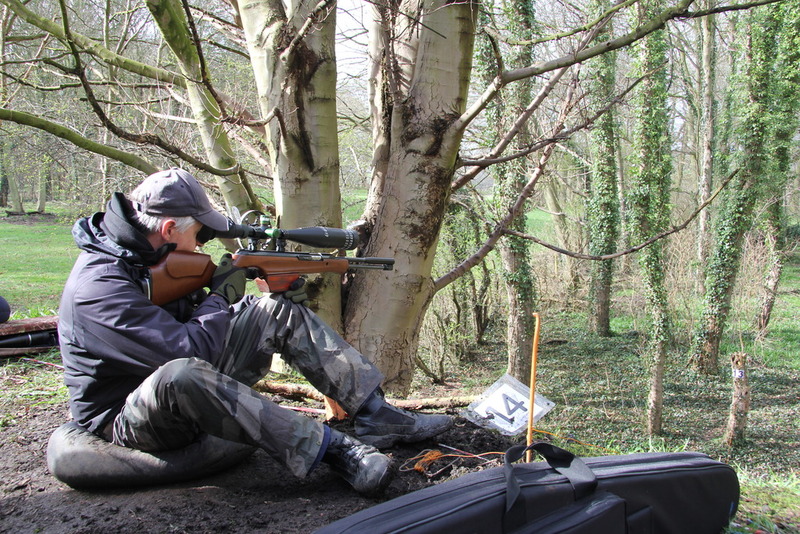 The majority of shots may be taken in any stance, but the seated position is the most popular due to its stability and often the need to see over logs or long grass that would preclude prone shooting. Most competitors carry a small beanbag or cushion to sit on while shooting. It may also be used under the knee or to support the ankle during kneeling shots, and they are often used as a protective rest for guns while competitors wait their turn to shoot. In competition, 20% of the lanes will be designated as compulsory standing or kneeling, and there must be as even a split as possible between the two. Most competitions have 40 targets arranged in 20 lanes, so it is usual to have 2 standing lanes and 2 kneeling lanes. Grand Prix events have 25 lanes, so there will be 2 lanes of one position and 3 of the other. Standing or kneeling targets must be no more than 45 yards (41.148 m) from the firing line. Points are scored with 1 for a hit (resulting in the faceplate falling), and 0 for a miss (whether it strikes the surrounding faceplate, misses it, or “splits” on the edge of the kill but fails to down the target). The highest score of a competition forms the benchmark for all the other scores – they are calculated as a percentage of this score rather than the total number of targets. This means that competitors attending a shoot on a windy day will not necessarily affect their average score over a season, as the highest score of the day will probably be lower. Members of the British Field Target Association (BFTA) are graded according to their performance every six months. Your average percentage score over this period determines which of the four grades you are given – (in ascending order of skill) C, B, A and AA. Prizes at shoots are awarded by grade, so less experienced shooters still have a chance of winning a trophy if they perform well. 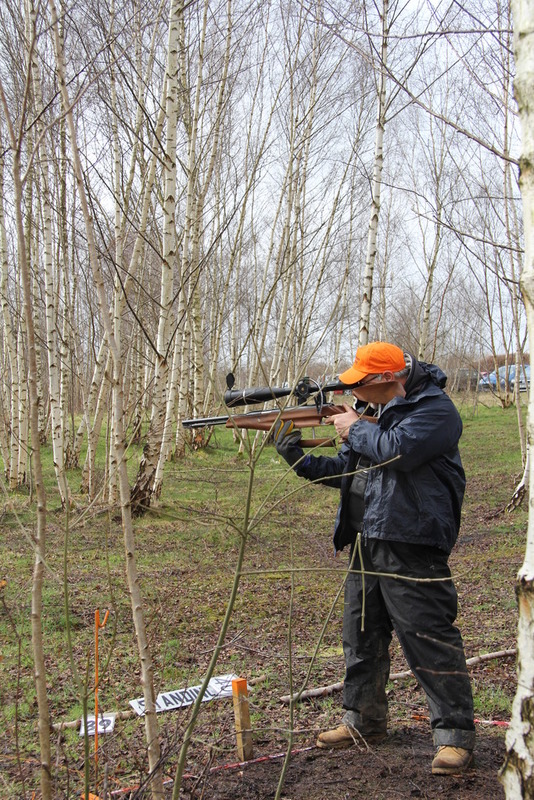 If your interested in joining the sport or would like further information please click here to find your nearest FT Shooting club.